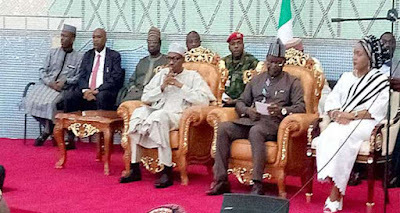 Leaders of herdsmen in Benue state on Monday told President Muhammadu Buhari that Miyetti Allah Cattle Breeders was not responsible for the incessant killings in the state. Buhari, who arrived in the state on Monday morning, held a meeting of stakeholder in a bid to find a lasting solution to the killings in the state. At least 150 people have been reported killed in the North-central state as a result of farmers-herders clashes this year. Governor Samuel Ortom had accused the Miyetti Allah, the umbrella body of herdsmen in Nigeria, of masterminding the killings in protest against the state’s anti-open grazing law. But Chairman of the group Ubbi Haruna denied the allegation. He urged all stakeholders to support the government to achieve peace.